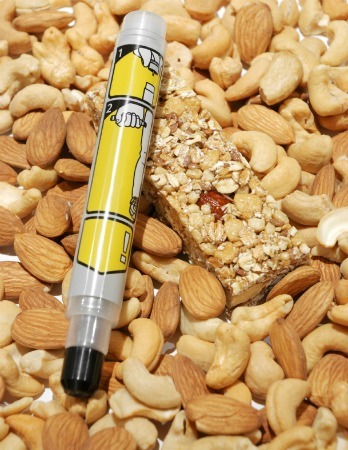 The most common food allergies are milk, peanuts, tree nuts, peanuts, wheat and shellfish. Here a few of these are pictured with an epinephrine auto-injector, more commonly known as an EpiPen. Food allergy basics: Dr. Karen DeMuth discusses food allergies, including peanut allergies, the difference between food intolerance and food allergies, common myths, and how patients with food allergies can protect themselves and stay safe and healthy. Though the prevalence of food allergies in children continues to rise, patients and their caregivers continue to take risks. In a seven-month survey of her clinic patients, pediatric allergist and immunologist Karen DeMuth, MD, MPH found that on average, only 59 percent of patients and/or their caregivers carry epinephrine auto-injectors, more commonly known as EpiPens. Of those carrying EpiPens, many had auto-injectors that were expired. Epinephrine, given through auto-injector in the thigh, is the first line treatment when a patient begins experiencing anaphylaxis, a life-threatening allergic response. "Consider an EpiPen to be like a seat belt that protects you when you’re in a car accident, and have it with you at all times," says DeMuth, an assistant professor of pediatrics at Emory University School of Medicine, allergist at Emory-Children’s Center and physician at Children’s Healthcare of Atlanta. "In the past year, three children in Georgia have died from accidental exposure to foods they were allergic to. With the availability and proper usage of an EpiPen, their deaths might have been preventable." In recognition of Food Allergy Awareness Week May 13-19, 2012, DeMuth offers the following tips for managing food allergies. Most accidental food exposures occur away from home. Don’t rely solely on avoidance of particular food to manage allergies, especially when dining in situations where you cannot control food preparation from start to finish. Trigger foods can sneak in meals in unexpected and accidental ways. Take two. Always carry two EpiPens. In the case that one fails or is expired, you need to be prepared. Get educated. Simply carrying an EpiPen isn’t enough. You need to know how to use it. Ask your health care team to teach you how and when to use it. Act quickly. The sooner you can get epinephrine into your system, the better. Having your EpiPen close by will ensure that you receive the treatment you need as quickly as you need it. Wear a medical alert bracelet. In the event that you can’t speak for yourself or don’t have an EpiPen, a medical alert bracelet will let emergency personnel know that you have a severe allergy and need epinephrine fast. Founded in 1988, Food Allergy Awareness Week aims to educate the public about food allergies, which currently affect eight percent of children in the United States.